Chinatown, one of the few downtown Manhattan frontiers yet to be spoiled by rich kids, is being threatened by a hipster invasion. It's happening, all right-just slower than you'd think. Historic, kinetic and wildly complex, Chinatown is the perfect backdrop for every trendy pleasure seeker’s vomit-tinged nocturnal pursuits. A recent spate of It openings—Sasha Petraske’s White Star on a grim stretch of Essex Street; a highly stylized cocktail lounge, Apothéke, on hook-shaped Doyers Street—should draw even more revelers. And that’s making some of the neighbors nervous. The growth of bars and restaurants on the neighborhood’s eastern fringes isn’t exactly new—Good World bar moved into a former Chinese barbershop–massage parlor on Canal Street in 1999, paving the way for places that previously would have seemed more at home, say, above Delancey Street: Bacaro (Frank DeCarlo’s latest Italian venture), Capitale (nightclub on growth hormones), Broadway East (upscale vegetarian), Clandestino (laid-back wine bar), Happy Ending (massage parlor turned watering hole) and Café Petisco, a spanking-new restaurant down the block from Broadway East. But unlike the East Village or the Lower East Side, Chinatown has long presented significant cultural and linguistic barriers to “outsider” entrepreneurs—protecting it, many argue, from the kind of gentrification that has priced so many people out of other downtown neighborhoods. So the recent opening of a place like Apothéke, located on one of Chinatown’s most historic (and quietest) streets, prompts the question of who stands to benefit: those eager to treat Chinatown as their latest absinthe playground, or the neighborhood itself, which, far from being a static monument, could profit from an infusion of cash. White Star owner Sasha Petraske isn’t apologizing. “The only people who have the right to make statements like that are kids who grew up in Chinatown,” he says, speaking to the inconvenient fact that many of those who oppose gentrification are gentrifiers themselves, eager to protect the abstract notion of a neighborhood and era that they were never really part of. Petraske arguably kicked off the nightlife migration below Delancey in 2000, when he began mixing cocktails at Milk & Honey on a dodgy block of Eldridge Street. He acknowledges that he was instrumental in that neighborhood’s gentrification. “People conflate two totally separate issues. What they don’t like are people who are inconsiderate and entitled. That’s not the same thing as money. What ruins a neighborhood is running businesses irresponsibly,” says Petraske, indirectly referencing the drunken partyers who litter certain New York City sidewalks. As for the unglamorous corner that is home to his latest venture: “This part of Manhattan is the only part left that can hold its own against Downtown Brooklyn,” he says with a laugh. Beatrice Chen, the director of education at the Museum of Chinese in America, takes a pragmatic view of the changes. She doesn’t fall on one side or the other of the gentrification issue, clarifying that though she doesn’t want Chinatown to become the next Lower East Side, she doesn’t want it to be stagnant, either. “Chinatown is still revitalizing after 9/11,” she says. “Forty restaurants closed after that month of blocking off Canal Street. That’s a huge consideration.” She also notes that outside entrepreneurs are hardly the only ones opening businesses there. 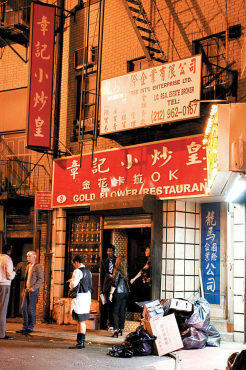 Yello, a popular and relatively new Chinese-American-owned bar on Mulberry Street, is “a sign of change in Chinatown”—the younger generation making its trendy mark—as is its neighbor, Mama Café, which is also owned by Chinese-Americans. Heather Tierney, for her part, doesn’t see Apothéke as a nail in the coffin for Chinatown. She wouldn’t: She’s a partner, along with Albert Trummer, the mixologist responsible for the more than 250 specialty cocktails being served at the bar, which occupies the former address of a Chinese restaurant and, before that, opium den. Tierney (a former TONY staffer) said she worked for three years with a succession of Chinese brokers to get a lease on the space. She thought “[It would be] a great place for a destination cocktail bar: It’s hidden and tucked away in another world.” While she admits that it’s been “like a mob scene” since it opened on September 5, Tierney maintains that she’d love for Doyers Street to remain as it is—peaceful, quiet—and is doing her best to control the number of people loitering outside the bar. Her desire, however, to help other “outsiders” get leases on Doyers plays directly to the fear that Chinatown will become yet another romper room for rich kids who blithely price the locals out of their homes. “I’d like to maintain authenticity while I’m at the same time gentrifying,” Tierney says, inadvertently summing up the well-meaning yet inherently unsustainable mentality that has given much of lower Manhattan the feel of a theme park. Though it may be easy to dismiss those who want to preserve the neighborhood in amber for nostalgia’s sake, it is something else to disregard the possibility of displacing the people who have made Chinatown such a great place for that destination cocktail bar.